Some questions in each section may not be of multiple choice type. Instead, direct answers are to be typed on the screen. In this post I will like to answer a few questions / doubts that some of the students have about the same. Let me add, these are my best guesses and I do not have any official information. How many “Direct Answers” type of questions will be asked in CAT Exam? My guess is around 10-15. One of the reasons, in my opinion, that something like this is being implemented is to lessen the impact of “shortcuts”. Eliminating options is often a good way of reaching the answer. In the “Direct Answers” type of questions, you will not be able to do that. I don’t think it should go much beyond that. What type of questions in CAT will have “Direct Answers”? Direct Answers will have to be numerical in nature. In the GATE exam, which is also conducted by TCS like the CAT, “direct answers” type of questions have a numerical pad associated with them. It is unlikely that CAT Exam aspirants have access to the keyboard. Keeping that in mind, you can eliminate almost all Logical Reasoning and Reading Comprehension questions. A huge chunk of “Direct Answers” type of questions in CAT 2015 will be in the Quantitative Aptitude and Data Interpretation part. Even in Data Interpretation, it is unlikely that complete sets would be “Direct Answers”. If they are, it might not be a bad idea to skip them. It is possible that there are some parajumbles questions that come in this category. If the unlikely scenario that it does happen, I would recommend that you skip the question. Even a simple Parajumble question which has 4 sentences, it will have 4! = 24 possible options. The trick to solving Parajumbles questions has always been finding a link between sentences and then eliminating options. If direct answers types of questions are asked on Parajumbles – it will be really tough and I would suggest that you skip them. I sincerely hope and honestly think, it won’t happen. Will “Direct answers” type of questions have negative marking in CAT Exam? No It will be extremely unfair to have negative marking in a direct answer type of question. The purpose of negative marking is to discourage if not eliminate guessing. That is already being achieved by replacing objective questions with “direct answers” type of questions. In the GATE exam, which is also conducted by TCS like the CAT, “direct answers” type of questions are asked and do not have negative marking. Another purpose is to reduce the use of shortcut tips and tricks like “eliminating using options”, which it serves very well. 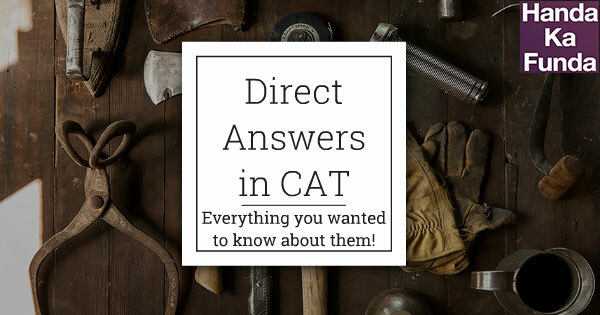 I hope with this post I have been able to eliminate some doubts about “Direct Answers” in CAT. If you have any more questions about the same, please ask us in comments. We will update the post accordingly.